When running a catering business you need to know that when you order an item from your supplier it is going to be in stock. If a supplier lets you down too often it is time to look for a new supplier who is reliable and give top quality service. Food stuff for your catering business needs to be fresh and in a ready supply when you need it. It is not always convenient to order foodstuff online and wait for a delivery. Stock could be of poor quality, out of stock or held up during transit. You will be left without the foods you need to prepare for your clients which will not bode well for future bookings or new clients if they hear of your supplier problems. Try to find several wholesale warehouses in your area and if you need specialist catering supplies on a certain date that are likely to be out of stock pre order them in plenty of time. Think of the food miles of your catering supplies and try to shop locally. For fruit and vegetables locate farms and farm shops that will be prepared to supply your catering company with the best of their wares. Many smaller growers will specialise in the rarer varieties of food stuff which you could use to your own advantage. If your clients know that you support local growers and like to present unusual food stuffs you will have a unique selling point that will make you stand out from your competitors. Have you watched those TV chefs who wander out from their restaurants situated in stately homes, casually pick a few herbs and take them to their kitchens? You could do this to – well not the stately home part but you could try growing your own herbs. Your kitchen may not have a large garden but it is possible to use window boxes or grow them at home. You will then have a supply of the type of herbs you need for your menu rather than rely on dried goods. If you yearn for the fresh air in your spare time away from your catering business why not rent an allotment? This would give you exercise, fresh air and also a possible supply of vegetables for your catering business. Most allotments are hired from local councils so put your name down and be prepared to wait. Sometimes there is a wait of several years before you are offered a plot. To be able to grow your own catering supplies is certainly a boon to your business. Clients will be impressed if you can offer an organic menu. 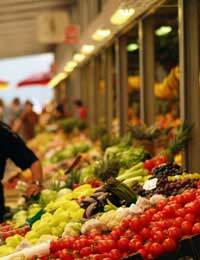 Source your organic supplies locally from farmers markets, smallholders and farms. Remember organic foods are more expensive so this would have to be accounted for when calculating your menu charges. Source reliable catering equipment suppliers as the last thing you need to happen is that equipment is broken or you need a larger stock before an event and you are not able to find what you need. Make sure that any table china and cutlery come from a repeatable design and is always in stock from your catering equipment supplier.